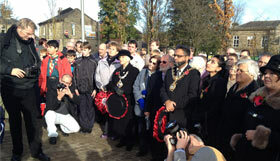 On Sat 10th November 2012 at the Remembrance Day memorial ceremony, the Darwen Spitfire memorial sculpture was officially unveiled by Darwen MP Jake Berry; also in attendance were members of the Royal British Legion and the apprentices of WEC Group who manufactured it. Wreaths were laid at the base of the sculpture during the ceremony, and the 250 plus Darweners in attendance made for a moving sight. 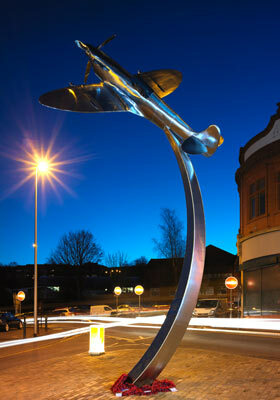 The Spitfire was manufactured by WEC Group apprentices and donated by the Group to the town of Darwen to act as a constant reminder of the sacrifices and efforts Darweners made in WWII, when they raised a sum of £5,000.00 - enough money to purchase a Spitfire for the R.A.F. The apprentices strived to have the feature ready for 10th November in time for the Remembrance Day Service, the unveiling attracted a massive audience and the memorial now stands at ‘The Green’ in Darwen town centre. WEC Group have committed themselves to ‘giving back’ to the local community over recent years, with the fabrication and donation of several public art features such as the new Darwen Tower Dome in 2011. "WEC has adopted the habit of accepting new projects from the local authorities every year free of charge so our apprentices can learn welding and fabrication while working on projects that benefit their town and bring pride to the local community." Steve Hartley, WEC Group MD has stated he is now open to suggestions for the next project the Group will manufacture and donate to the town.